The matter of the water supply does not trouble us much. We turn on the taps and enjoy clean drinking and bathing water without fuss or effort. Until the 1840s, the fetching and carrying of water was a major task in Stirling. Circuit Judge Lord Cockburn deplored the fact that ‘the public wells have only one spout each…poor people are obliged to stand shivering for hours before they can get their vessels filled. …I counted 200 tubs, pails, pitchers etc ….with their owners waiting their turns from the solitary spouts. I told the Provost that if I was in his place, these evils should be remedied in a month, simply multiplying the spouts at the existing drawing places.’ The public wells were also contaminated and a proven source of illness. As ratepayers objected to a compulsory water rate, it took an Act of Parliament in 1848 and the creation of the Stirling Waterworks Commission to resolve the issue. 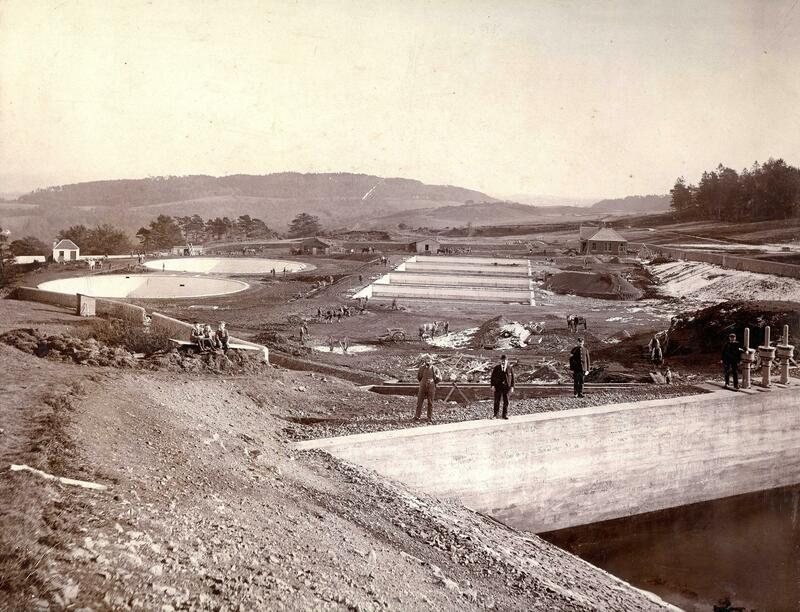 The photograph (taken by Stirling’s premier photographers, Crowe & Rogers) shows the new filter beds in the Touch Hills, under construction, November 1895. The engineers were McLuckie and Walker, and Alexander Gall was the main contractor. The photograph is a recent gift to the Smith by Mrs Wilson of Alva.